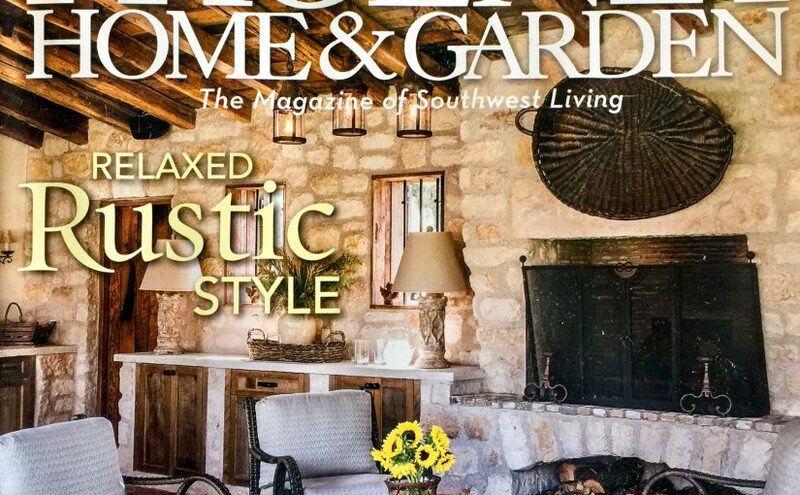 This article appears in the September 2015 issue of Phoenix Home & Garden. It features our home garden. The copyright access to the photos expired, so I’ve added a gallery of similar images at the end. Hope you enjoy the tour. Rich and Linda Larson created a looping path in their backyard that takes visitors past several sitting areas and garden-art displays. in progress. Linda and Rich Larson’s decades-long collaboration in their Mesa landscape epitomizes this idea. They thrive on designing, building, revamping, planting, replanting, accessorizing and tweaking just about every square inch of their backyard to fill their personalized space with fragrant blossoms and smile-inducing art. Designed by Rich to resemble the rays of the sun, this distinctive garden gate hints at artistic delights within. And bloom it does—even in the midst of seemingly endless hot summers. “Of course, spring is the best time for flowers in the low desert, but we also enjoy lots of color in summer,” Linda adds. Rich produced a flower-shaped hose bib from implements salvaged from Linda’s family farm in Indiana. Her diverse palette of reliable hot-weather bloomers for the landscape consists of Baja red fairy duster, ‘Brakelights’ red yucca, cape plumbago (blue or white flowers), gaillardia, lavender star flower vine and ‘Little John’ dwarf bottlebrush. Others she likes to incorporate include pink-and-yellow lantana, pink trumpet vine, Mexican bird of paradise (red or yellow), ‘Summertime Blue’ emu bush, ‘Tangerine Beauty’ crossvine and yellow bells. And for annuals in garden beds and in patio containers, she likes to grow ‘Strawberry Fields’ gomphrena, pentas, portulaca, sunflower, vinca and zinnia. Not only do these plants provide for wildlife, they also survive the wide temperature fluctuations that occur in the couple’s microclimate, which peaks at 120 degrees in summer and drops as low as 25 degrees in winter. Rich and Linda’s backyard faces a golf course, and as cold air flows along the fairways, it settles into their garden. In winter, the result may be frost-damaged plants; however, in summer, slightly cooler air provides a dash of welcome relief. He also created Mr. Peepers, a whimsical piece of garden art made from wood. 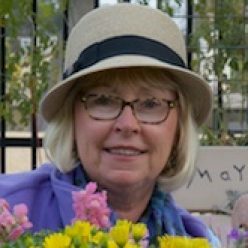 Both retired educators, the Larsons enjoy traveling and touring gardens, gleaning ideas to incorporate into their landscape when they return home. Mr. Peepers is the result of one such adventure. Rich and Linda spied a similar cheeky character peering over a fence on Whidbey Island, Washington. Rich constructed his version from wood with a metal base and posi-tioned the snooper as if he happened to be a passing golfer peering into their yard from the course. At first glance, Mr. Peepers’ surprisingly lifelike stature startles visitors, before invoking laughter and delight. “About 15 years ago, I had enrolled in my first woodworking class at Mesa Community College so that I could build things for the garden,” says Rich. He continued the classes, bought tools and eventually took welding courses to add to his skill set. Many of the artistic pieces emerging from his workshop also serve practical pur-poses, such as arbors, privacy screens, faucet bibs, hose holders and rock-filled gabion cubes on wheels. Rich created this drafting compass shape with metal poles that also fit into his custom-made gabion cubes and replace umbrellas. wedding anniversary, and Linda and Rich make a point of striking the bell together each day. Finding the perfect spot to showcase the bell and myriad other artworks was the driving force behind the couple’s 2013 backyard rejuvenation. Collaborating with Jeff Neilsen of Desert Green Creations, they shaped a path to loop around the backyard, creating natural stops en route to view art and flowers up close. Standard wood tree stakes have been shaped and painted to resemble a collection of oversized artist’s tools. The redesign also made space for seating areas with varied views and exposures, depending on season and time of day. A shady setting beneath an olive tree adja-cent to the golf course beckons year-round. There, custom-made Adirondack chairs—one for tall Rich and the other for “less tall” Linda—offer the perfect vantage point for viewing vibrant sunsets in winter, as well as a comfy spot to sip early morn-ing beverages during summer, when cool air flows off the golf course. The project took about 11 weeks, with the homeowners on-site daily to guide the process. Garden beds were dug and filled with fresh soil; new plants better able to withstand temperature extremes were added; a soothing water feature near the patio was installed; and an irrigation system was upgraded with nine valves that allow efficient watering schedules for conservation and plant health. “We kept an existing patch of lawn because we didn’t want to damage tree roots that had grown into it, so the irrigation upgrade allows us to water grass efficiently,” explains Rich. “Our garden doubles our living and entertaining space,” says Rich. We’re outside every day.” As members of a gourmet-cooking group, they enjoy hosting events in their backyard. Noticing that guests tend to mill about on the patio, they now set appetizer tables around the garden, enticing people to stroll the path to experience the sights and scents while nibbling hors d’oeuvres. At a recent event, dubbed “Barefoot Bliss: A Celebration of Spring,” invitations forewarned guests to wear shoes that would be easy to kick off—all the better to wiggle toes in the lush grass. “If I’m going to have a lawn, I’m going to use it,” says Linda. The evening’s theme continued with a menu featuring dishes from the “Barefoot Contessa,” a Food Network cooking show. Built to honor the homeowners’ 40th wedding anniversary, the steel bell’s gabion arch is filled with polished jade-color rocks. Whimsical Mr. Peepers is visible to the left, peering from a Baja red fairy duster shrub that blooms much of the year. The Larsons enjoy the hands-on aspect of gardening. Linda uses soft-sided fabric Smart Pots slipped inside many of her ceramic or clay containers because they drain well, reduce heat build-up and fit into straight or tapered pots. The wall mural’s cottage garden motif helps camouflage a utility space. Easy to move, this decorative screen hides the side yard’s work area. Versatile wheeled umbrella stands are moved around the patio as needed to act as cocktail tables with built-in shade. Their rock-filled gabion structures stand firm during the desert’s windy monsoon season.